I suppose this is only not safe for work if you work for a Jewish institution or have an aversion to knowing where your meat comes from (yes Krista, I am talking about you). In my grand tradition of trayfing it up after the long stretch of the High Holidays, I decided to go whole hog… literally. I couple of Tuesdays ago I got a facebook message from Ryan Farr of 4505 Meats, that he had gotten his hands on a pig and would be teaching his highly sought out Whole Hog Butcher class that Friday. Ever since Gordon and I took his lamb butcher class I had been wanting to get into the hog class but he hadn’t held one in months so I jumped at the chance and hit redial until I was enrolled. Liver, heart, gizzard- all the makings of Jerusalem classic for Jerusalem Day. The mo’arav yerushalmi is a classic sandwich that is available all over the new city of Jerusalem, especially in the small eateries around the Machane Yehuda markets that serve as the primary outdoor markets of the Jewish side of town off of Derech Yaffo (literally the way to Jaffa- which it still is from the center old city). Of course this tasty combination of chicken organ meat is not really a Jerusalem dish. It is in fact a corruption of the English mixed grill brought to the Yishuv (pre-1948 Jewish proto state) by the British army that occupied a good chunk of the near east under the terms of the Treaty of Versailles and the League of Nations mandate system. The British version consists mostly of lamb parts, the Israeli version features either chicken or turkey organs with a dash of ground lamb or lamb fat for flavor. Properly served it comes on a baguette (a result of Israel’s Francophillia in the 60’s) or pita with hummus, salad, a dash of schoug and of course french fries (called tcheeps in Hebrew, after the English chip). Korech, Hillel’s sandwich at the Temple. It is said that when the Temple still stood in Jerusalem Hillel would combine matza, maror and the Pesach lamb into one in order to observe the mitzva of eating the sacrifice on matza and maror (Numbers 9:11). It might also be the case that he was hungry and dinner was still being organized in the kitchen. Now, what if we still had a temple? What if we still made the sacrifice? What would a modern chef do with such a sandwich? I think the answer would be the kosher for passover BLT. I put this to the test by taking some of the lamb saddle from our butchering class and curing it with pink salt. Cured and smoked I then sliced it up and placed it on some homemade matza, with fresh parsley, horseradish mayo and of course fresh tomatoes. Hillel would have asked for seconds. A few weeks ago Amiee and I went to learn how to butcher a lamb. It was fun and we learned a great deal about breaking down whole quadrupeds. But on a more immediate level we got to try some of Ryan Farr’s chicharrones. Now there is a Jewish version of this, gribenes. I have made them before, usually a result of using chicken thighs for something where the skins weren’t needed and I would slowly render them down and feed them to the kids (my son calls them “chicken chips”). 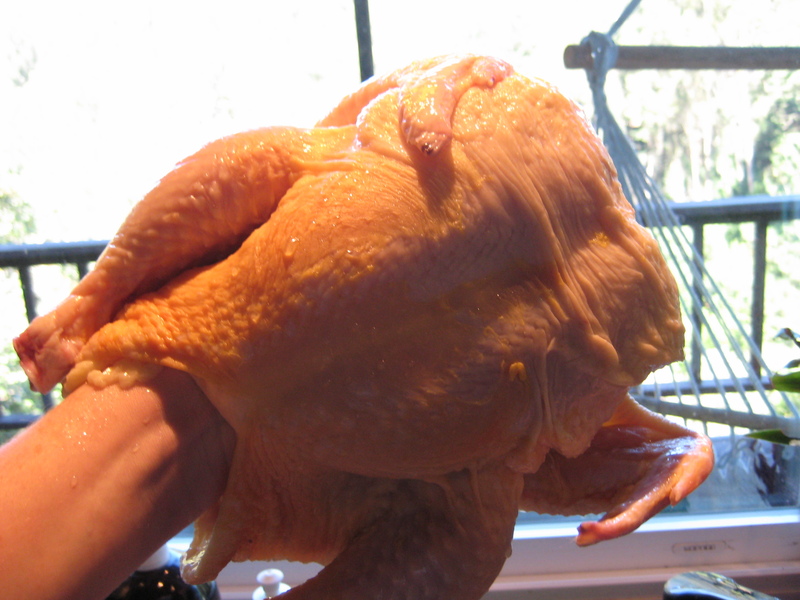 But recently I was breaking down a whole chicken for sausages (post on the way) and I thought that I would try to remove the skin in one go and then render that down. The results were astounding, so I am sharing the results here. By the way, its kosher for passover and you get about a half a cup of nice clean fat (schmatlz) to boot. Can we get a syndication deal now? As a slight change of pace and in preparation for Passover, Gordon and I signed up for a lamb butchering class taught by the amazing Ryan Farr of 4505 Meats. In true heathen style I came across Ryan in a New York Times article on fried pig skin. In addition to the delicious sausages he sells at the Ferry Building Farmers Market, Ryan is known for his amazing chicharrones, that he thoughtfully shared with us at the end of class (along with some grilled kidneys and other treats). The class was held in San Francisco non-profit, incubator kitchens of La Cocina.